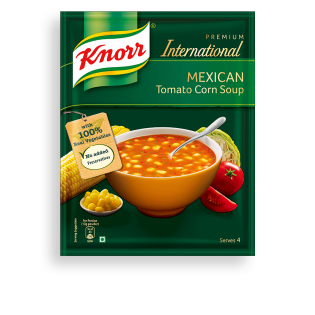 Knorr has hand-picked the best quality vegetables and mixed it with spices to make delicious Knorr Mexican Tomato Corn Soup. A flavoursome mix of corn, leeks, garlic, black pepper and tomatoes that give your taste buds the ultimate Mexican zing. Team this up with a corn chips, nachos & salsa and you have a Mexican fiesta! What's in our Mexican Tomato Corn Soup?